Looking down at my plate, at the deep-fried asparagus spear in front of me, I shook my head solemnly. We've had plenty of tapas over the years, but this was entirely new to me. I took a quick sip of delightfully dry Txakoli, and negotiated the blistering hot batter with slippery fingers. Naturally, in a city famous for its pinxtos, the locals know just how to enjoy the very best dishes. Pinxtos, are the Basque Country's answer to tapas. But instead of small platters of charred and salted padron peppers, plump pink shrimp swimming in garlic-infused oil, fried potatoes and lashings spicy sauce and piping hot bowls of albondigas, it is delicious fresh local ingredients expertly speared between a toothpick and, traditionally, a small piece of bread. Fantastic one bite wonders such as olive, pickled green peppers and salty anchovies or goats cheese and mushroom. Enjoy amongst friends over a glass of wine, eat as a prelude to dinner, or go bar to bar collecting toothpicks and sampling a little of everything. As we discovered, food in the city of San Sebastian is far more than just something to survive on. In this corner of Spain, food and all it encompasses is life. And with more Michelin Stars per capita that anywhere else in the world, it's something they're evidently rather good at. 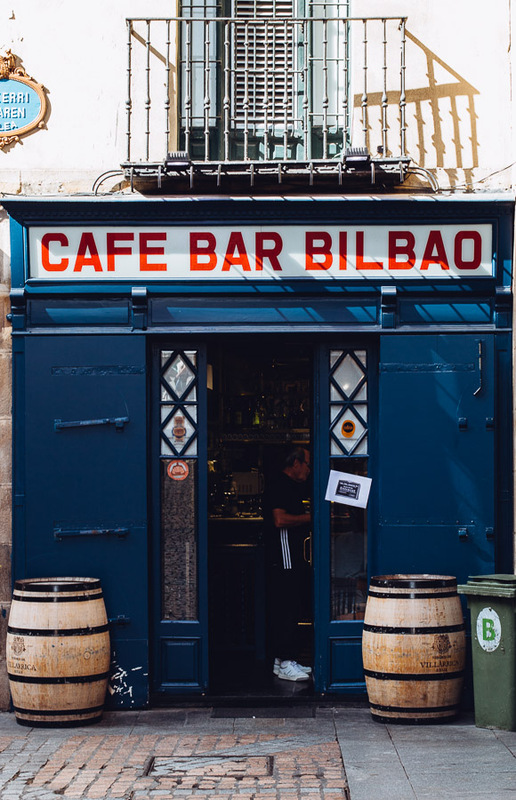 Yet whilst food has for generations attracted visitors to the Basque Country, it was the opening of an altogether different attraction in 1997, that delivered seismic change to the region. The Guggenheim, and the so-called Bilbao Effect. Twenty years ago, before Frank Gehry's architectural masterpiece was unveiled, Bilbao was just another post-industrial city, scarred by terrorism and failing hard following the rapid decline in shipbuilding industry. The once busy waterways of the River Nervión ran polluted, the factories were shuttered and the port sat decrepit - Spain's fourth largest city needed a spark of genius to return it to its former glory. A leap of faith, and a shimmering titanium ship conceived by one of the world's greatest architects provided just that. And whilst the decision to take vast amounts of public money and invest in such a grand design and a phenomenal art exhibit may have been controversial, what becomes abundantly clear when speaking with those from the region, is that the decision paid off. Visitor spending in the city boomed, and five years after its opening, building costs were fully recouped and the local economic impact of the Guggenheim reached and estimated €168m. In the face of adversity and shifting priorities, Bilbao created a landmark that spawned its future, a landmark that has increased tourism and tourist income across the entire Basque Country, and single-handedly created one of the Europe's hottest new weekend breaks. The beautiful Old Town and riverside area have been redeveloped; the foodie scene is thriving (you simply have to visit Mercado de la Ribera); there's a metro by Norman Foster replete with iconic 'fosteritos'; a Santiago Calatrava bridge and in the shell of a former wine cellar, a Philippe Starck cultural centre. And although not all can be laid at the doors of the Guggenheim, there is no denying the impact this remarkable structure has had on this once dying city. The question is, is there more to the Basque Country than culinary delights and the avant-garde? Without a moment of hesitation, the answer is yes. For a start, there's the ocean - and all that edges it. Hundreds of kilometres of epic coastline, rugged cliffs and wild ocean make the Basque Country one of Europe's most popular surfing destinations, attracting the old and the young to the region's best breaks all year round. 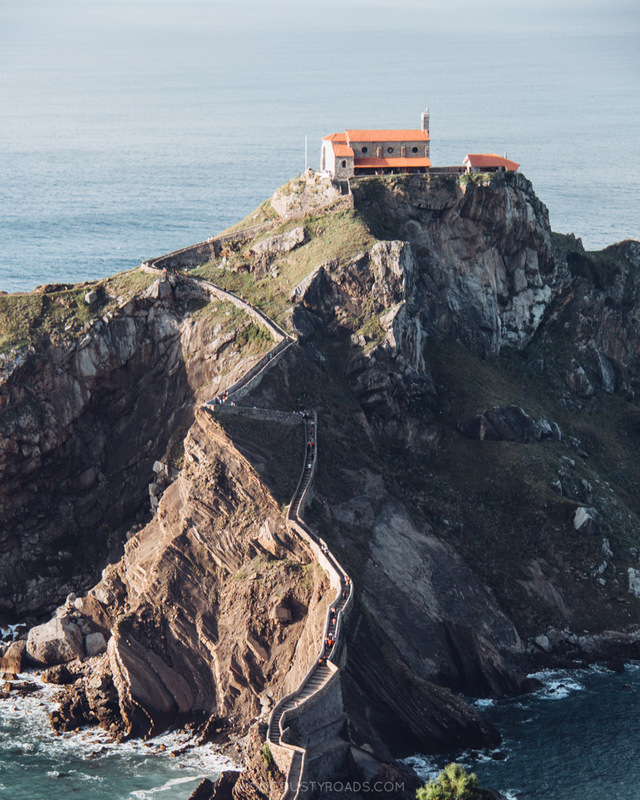 And then there's San Juan de Gaztelugatxe, an islet on the Biscayan locality of Bermeo. Attached to the mainland by an remarkable bridge of two archways, this rocky outcrop famed for a footprint from Saint John the Baptist, has long been a destination for pilgrims. However, following a cameo as Dragonstone in Season Seven, a new sort of pilgramage has arisen - with a record 75,000 Game of Thrones fans flocking to the site in July alone this year. Like much of Northern Spain, wine forms a crucial part of the landscape and the economy here. Acres of harvest-ready vines, wide open spaces and a sweet smell that hangs in the air; tracing a path between green valleys and ash-coloured mountains, the road that winds itself through the verdant region of Rioja Alavesa is surely one of the most impressive in the Basque Country. Delivering visitors to tiny villages and medieval towns, walled settlements that appear so distinctly of the north; that to the uninformed appear so French. 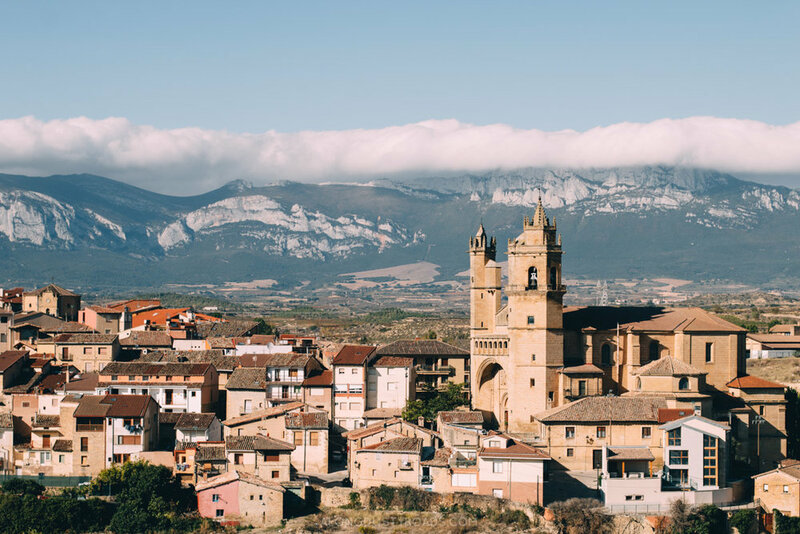 Towns such as Laguardia, arguably one of the most beautiful in all of Spain, where tourists mix with locals and the txapela is as common as a camera. Herederos del Marqués de Riscal, located in the tiny village of Elciego is the oldest winery in the region, producing an exceptional rioja 150 years in the making. Yet, this no normal winery. Alongside quaint stone buildings that have seen harvests stretching back two centuries, sits a contemporary hotel rising up between the vines. Waves of pink, silver and gold metal bend elegantly around Hotel Marqués de Riscal, playfully alive with the final days of a bright summer sun; a work of art that now attracts more visitors to the region than fine wine alone could possibly provide and giving new life to a land of verdant green vineyards and a village wonderfully in the past. This supremely modern hotel was designed by none other than the very same architect that gave birth to the Guggenheim. 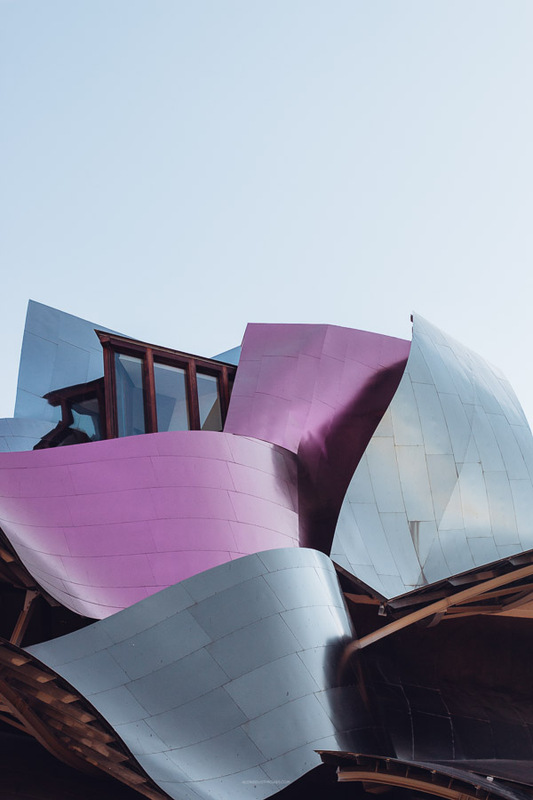 Wild theory, an operation in cause and effect, or a very clever PR stunt, Frank Gehry's work has undoubtedly put the Basque Country on the map. It may take some time, but perhaps the Bilbao effect is not limited to Bilbao alone. This article is written in partnership with the Spainish Tourism Board and the local tourism board of The Basque Country, and in cooperation with The Travel Mob as part of the #InGreenSpain campaign. All opinions are our own and based on personal experience.